2010 has been a good year. A family member got sick, but he is better now. In November, the Giants won the World Series. Health care reform passed in March. In November, Jerry Brown won the gubernatorial election, saving us from another novelty governor. In general, the November elections were disappointing. The Citizens United decision has wounded our country deeply. In December, the Senate confirmed the Start 2 treaty and Congress repealed Don't Ask, Don't Tell. This is the 300th post in this blog for the year, the 840th overall. I had an interesting year. I have enjoyed the regular monthly series. In the train stations series, I posted pictures of all the surviving stations of the Ocean Shore Railroad. In the aviators series, I found some interesting people and newspaper articles. I want to write more about Israel Ludlow and Walter Wellman. I have gotten some nice comments on the William Coulter series. In writing about the remarkable Van der Weyde (Vander Weyde, Vanderweyde) family, I found articles about Doctor Peter Henri, his wife Jeanette, their son Henry, and their grandson William M.
I wrote about the 125th anniversary of the publication of Huckleberry Finn, the 100th anniversary of Mark Twain's death, but somehow I didn't write about 175th anniversary of his birth. In February, I contributed three articles and some cash to the For the Love of Film film preservation blogathon. We raised about $13,000, which will be used to preserve three silent films from a large cache discovered in New Zealand. In March, I spoke to the Daughters of the American Revolution about the transcontinental railroad. Angels Flight reopened in Los Angeles. I started short monthly series on the Wax Museum and the Jejune Institute. In June I started a series about doors. In July, we visited Seattle (first time ever) and Disneyland. The BP Oil Spill started. Somehow, I never mentioned it here. I started a new series of magazine covers with slapstick performers. 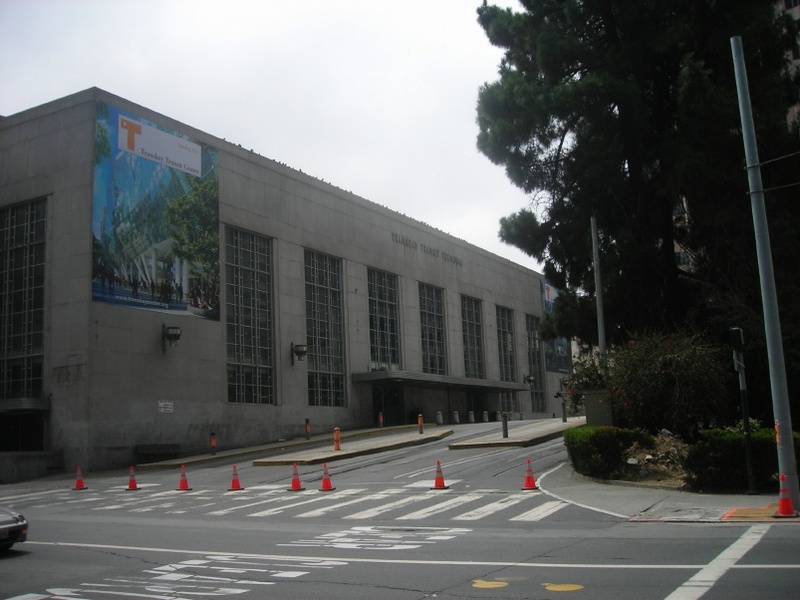 In August, the East Bay Terminal closed. Demolition started later. It has been the source of many posts. September was the bicentennial of El Grito de Dolores. In October, I spoke to fifth and sixth graders at Good Shepherd school about Paul Revere. I was interviewed by Ken Bastida of KPIX Channel 5 about ferryboats. I got called a historian on television. I started a new series about Benny Bufano. In November, Kevin Brownlow won an Oscar for his work in film preservation. I finished my series on Grauman's Chinese. The Giants won the World Series (It is worth repeating). In December, there was the 150th anniversary of South Carolina's shameful secession from the union. Some current defenders spelled it "succession." I also had the pleasure of hosting my first guest post, a nice essay about Hitchcock's The Birds. I wrote reviews of three DVD sets, American Slapstick II, Harry Langdon: Lost and Found and Lost Keaton. We are lucky to be living now. I have wanted to see many of the movies for many years. I've been watching a set about Gaumont, but I won't finish it till 2011. Three last updates for 2010: The Stanford women broke UConn's record 90-game win streak last night. We watched the second half. Today San Francisco was name host of the next America's Cup races. Finally, the Giants won the World Series. 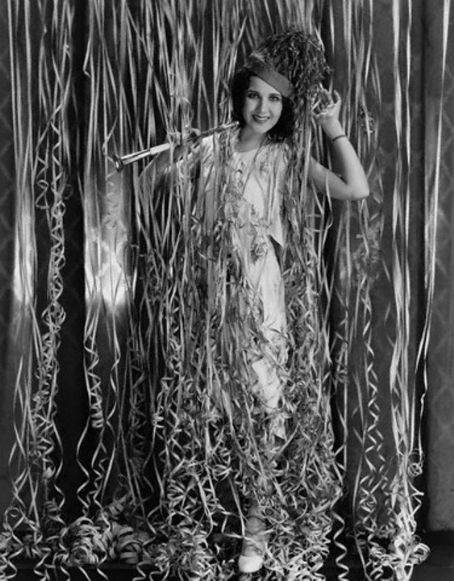 I hope we all have a happy and prosperous 2011. I hope to do some interesting things with this blog. From the 23-August-1896 San Francisco Call. William A Coulter did many maritime drawings for the newspaper. Click on the image for a larger view. The Pacific Coast Steamship company's steamer Queen, also known as Queen of the Pacific, was one of the best ships carrying sourdoughs to Alaska for the next year's Yukon Gold Rush. I'm not clear if the "whaling" mentioned is actual whale hunting and killing, or an early version of whale watching. Pacific Mail Steamship Company steamer Columbia went on the rocks near Pigeon Point on 14-July-1896. No one was killed. Saint Paul, also a Pacific Mail Steamship Company steamer, grounded at Point Pinos on 09-August-1896. THE QUEEN ON A WHALE HUNT. She Goes Out This Morning to Capture a Leviathan. The Pacific Coast Steamship Company's handsome Alaskan steamer Queen started on a whaling cruise this morning. Two boats' crews went out last Friday and have been cruising on and off around the Farallones ever since. A whaleboat and its crew will accompany the Queen, and should a whale be sighted before the other boats are picked up it will at once give chase. If a whale is not sighted the steamer will be headed for the wrecks of the Columbia and St. Paul, now lying at Pigeon Point and Point Pinos. The work of provisioning and getting the Queen ready for the whaling cruise has been a hard one. The officers of the company have worked night and day, however, and this morning she will go out thoroughly equipped. 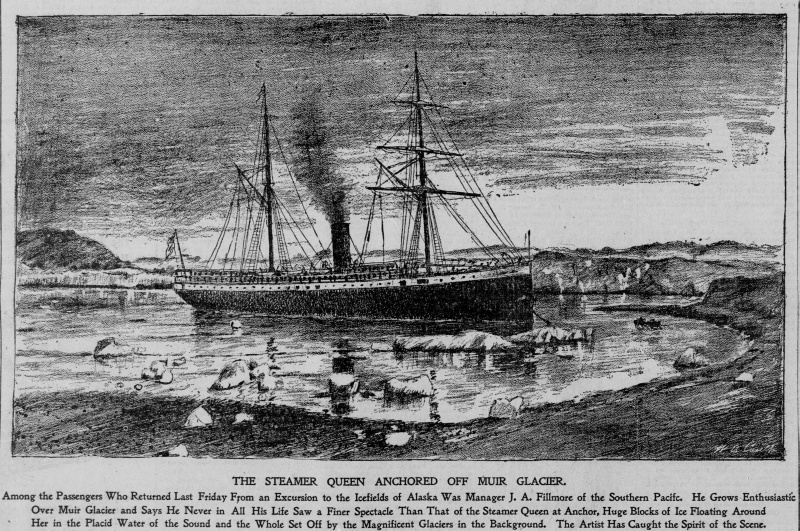 THE STEAMER QUEEN ANCHORED OFF MUIR GLACIER. Among the Passengers Who Returned Last Friday From an Excursion to the Icefields of Alaska Was Manager J. A. Fillmore of the Southern Pacifc. He Grows Enthusiastic Over Muir Glacier and Says He Never in All His Life Saw a Finer Spectacle Than That of the Steamer Queen at Anchor, Huge Blocks of Ice Floating Around Her in the Placid Water of the Sound and the Whole Set Off by the Magnificent Glaciers in the Background. The Artist Has Caught the Spirit of the Scene. I took this photo on the afternoon of Christmas Day. We left soon after for my mother's house, and it rained hard all the way. Yesterday the sun came out. Today it was cold. Merry Christmas, everyone. Peace on Earth and goodwill to men (women, and children). 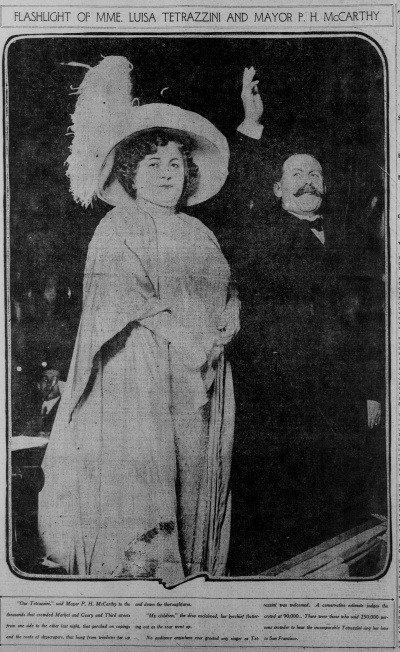 The image is from the 24-December-1910 San Francisco Call. 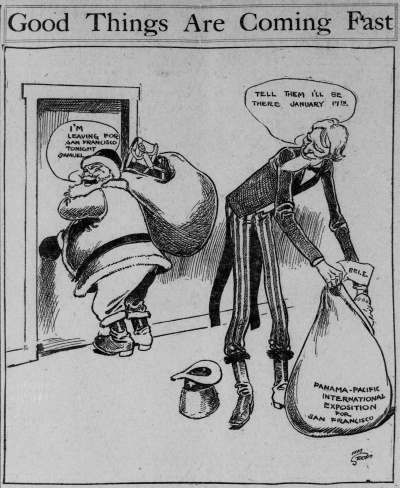 Santa Claus is on his way to San Francisco and Uncle Sam says he'll be along on January 17 to let them know if they have been awarded the Panama-Pacific International Exposition. Yesterday we went to 5 o'clock mass. There were lots of people. Three Good Shepherd students read the first reading and the Gospel. I'm grateful that Knights of Columbus members helped with the collection. On 24-December-1910, opera singer Madam Luisa Tettrazini performed at the intersection of Geary, Market and Kearny, before an enormous crowd. "A conservative judges the crowd at 90,000. There were those who said 250,000 persons crowded to hear the incomparable Tetrazzini sing her love of San Francisco." The event was sponsored by the San Francisco Chronicle, which had its headquarters at the intersection, but other newspapers chose to describe the location as Lotta's Fountain. This image is from the 25-December-1910 San Francisco Call. She poses at the event with Mayor PH (Pin Head) McCarthy. I'd like to thank Camiele White for her kind offer to create this guest post, the first on my blog. Be sure to pay Camiele a visit at Star Costumes (http://www.starcostumes.com/). It goes without saying that Alfred Hitchcock is probably the epicentre of all things cinematic. With his uncanny sense of perspective and lighting, he effectively educated the world on the simplicity of fear. What most would never even consider as shocking or frightening Hitchcock exposed as truly terrifying. In my mind, there’s no other director of suspense that has had the good sense to tackle those subjects so banal that they go unnoticed by the trained eye. Case in point: The Birds. Humans have always had the desire to fly as a bird, to see the world as it is above the clouds. However, with advents of planes and instant travel, there came intense waves of claustrophobia, fear of terrorism, and an unsettling feeling of being in the hands of a complete stranger with unconscionable power over a flying, metal vacuum. As with the Wright brothers, Hitchcock had the world quaking with fear. The idea of being pecked alive by the very majestic creatures we’ve learned to adore as the freest species constructed has forever niggled away at our sense of safety. For the first time in cinematic history (well, as far as I can tell) a film pushed the boundaries of what the audience could experience. 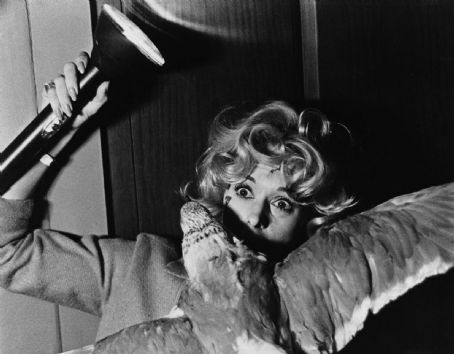 The Birds allowed the audience to experience the power of Mother Nature at her most wrathful. Those who’ve seen the film understand the implications --a society built of the caged “other” (in this case, birds, to which there is an undying fascination) becomes hell-bent on reconfiguring the balance --the prey becoming the predator, essentially. But, there’s more to the film than the obvious social commentary. How many times have you been at a dock, a menagerie, or any other space overrun with pigeons? Do you remember being around someone who had the instinctive urge to duck or dodge anything that made a sudden movement towards them? What an interesting revelation when you find out the source of that desire to risk bodily harm to avoid a beak came from Hitchcock’s avian classic. Every subsequent generation following The Birds has had to endure a heightened sense of unease whenever around open areas populated by an alarming amount of bird life. The senses have been recalibrated to be attuned to the sound of wings flapping, irrational squawking noises, and overhead shadows of gangland pigeons waiting to attack. Scenes like the infamous image of a man slouched in a corner dead with his eyes gouged from his head are imprinted in the human psyche and forces certain members of the so-called “intelligent race” to react like cockroaches when the lights are suddenly turned on in the kitchen: scattering and slithering atop each other just to get out of the way and find a dark hiding spot where the killer can’t find them. It’s actually pretty hilarious until you revisit the film and find it oddly difficult to step foot outside lest a swarm of predatorial doves seeking blood suddenly swoop down from their perches. Thank you, Alfred Hitchcock. You’ve given horror, film, and the morbid corridors of the mind new fears to consider and exploit. As unexpected as her path was to loving all things weird, more unexpected is her ability to get attention for writing about the stuff. From Japanese horror and Korean melodrama, to the acid soaked animation of the 70s, Camiele White loves to talk about, debate, and watch film that teases, pleases, and messes with the senses. Right now, she gets her jabberjaw jollies writing about Halloween costumes. If you want to give her a buzz, she can be reached at cmlewhite at gmail [dot] com. 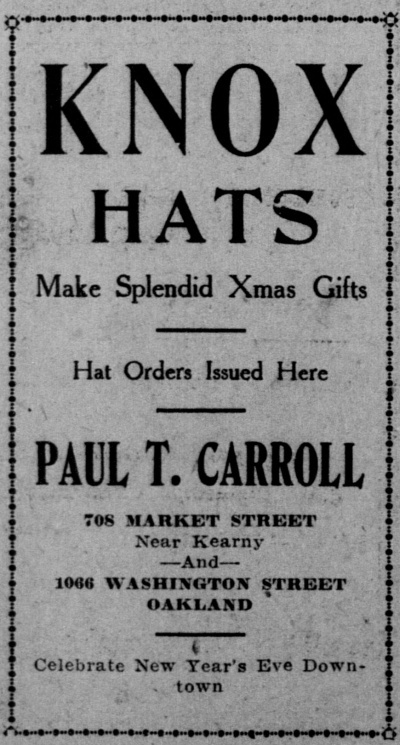 "Knox Hats Make Splendid Xmas Gifts." An ad from the 18-December-1908 San Francisco Call. I like wearing hats. It rained a bit in the morning. The sun came out in the afternoon. It was cold and windy at lunch time, but I had to take a walk by the East Bay Terminal to see what was left. The big red crane was dropping a wrecking ball on the upper floor. The ground shook as I walked by on Fremont Street. 150 years ago today, 20-December-1860, a convention in South Carolina declared that the state was going to secede from the United States. I am aghast that some people claim that the war was not about slavery. The root cause of the war was slavery. To get people in the North to fight, Lincoln emphasized that he wanted to preserve the Union. To get non-slaveholding people in the South to fight, its leaders stressed that the evil Northerners wanted to impinge upon their rights. The trouble is, the right the leaders most wanted to defend was the right to keep fellow human beings as chattel slaves. One person mentioned on the internet today that a union is not a union unless members have the right to secede. He said the European Union is a union because member states can secede. He said a union from which states cannot secede is an empire. He ignores the basic reasoning of Abraham Lincoln, that the United States, despite its name, is not a union of states, it is a union of people. That is why the preamble of our Constitution begins "We the People," not "We the states." 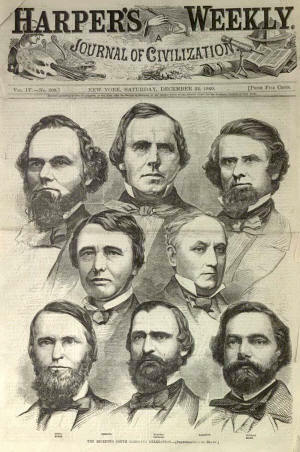 The image of the South Carolina congressional delegation, which withdrew from Congress, is from the 22-December-1860 Harper's Weekly. This Southern Pacific schedule is from the 29-December-1910 San Francisco Call. Note the Netherlands Route (riverboats to Sacramento) and the Oakland Harbor Ferry (also known as the Creek Route, to the foot of Broadway). The storm continues. Some areas have had record rainfall. I went to the barbershop today. 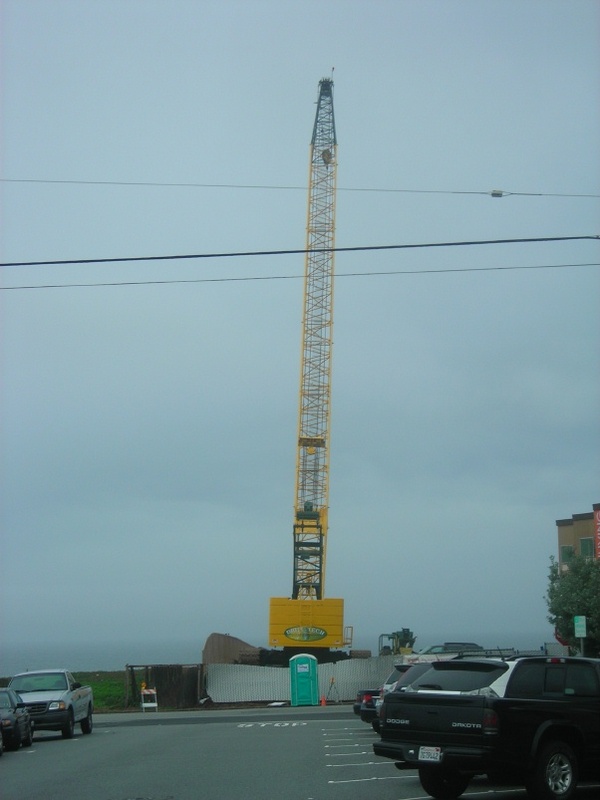 After I got out, I stopped to take a photo of the big crane that has been sitting at the end of Aura Vista Drive (Bill Drake Way) for some time, placing rip rap along the bluff by the ocean. Last night there was a big wind storm. It has rained on and off all day today. 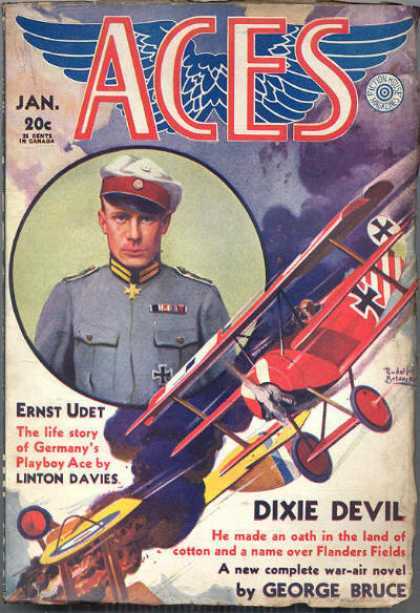 The cover of the January, 1932 Aces features Ernst Udet, the highest scoring ace to survive World War One and recipient of the Pour le Mérite. I assume the red Fokker Triplane is his. After the war, he appeared in movies and toured the world giving exhibition flights. After the Nazis took power, he joined the party and became head of the new Luftwaffe's development wing. When World War Two broke out, Udet felt overwhelmed by the Luftwaffe's problems and eventually killed himself. 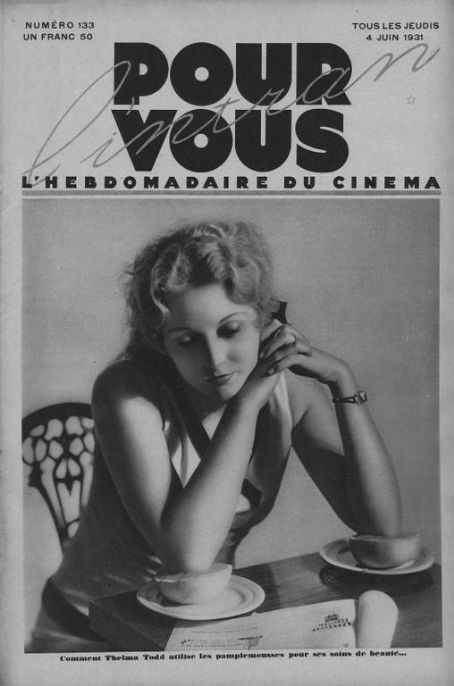 75 years ago today, beautiful and funny actress Thelma Todd was found dead in her car in a closed garage. People debate whether it was an accident, a suicide, or a murder. In any case, it sure was sad. She was a wonderful comedienne in two Marx Brothers movies, many Laurel and Hardy movies, and starring series of short subjects with Zasu Pitts and Patsy Kelly. Bob Feller, great pitcher of the Cleveland Indians and WWII Navy vet, died. My father was a big fan. Director Blake Edwards died. His step-grandfather was silent director J Gordon Edwards. Blake obviously grew up watching a lot of Laurel and Hardy. James Moody, the great reed man, also died. 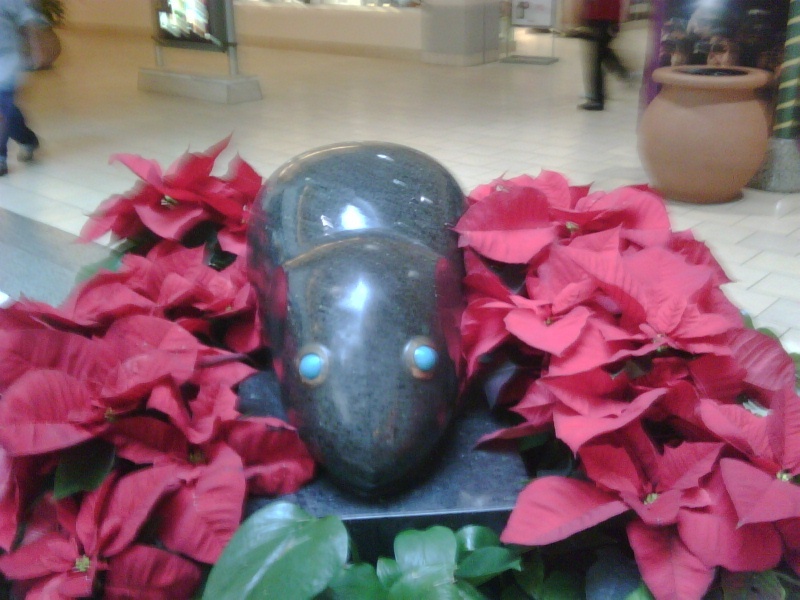 Hillsdale Mall developer David Bohannon commissioned sculptor Benny Bufano to provide sculptures to decorate the new mall in San Mateo. Bufano opened a studio on the mall site in 1955 and created ten of his famous animal sculptures. 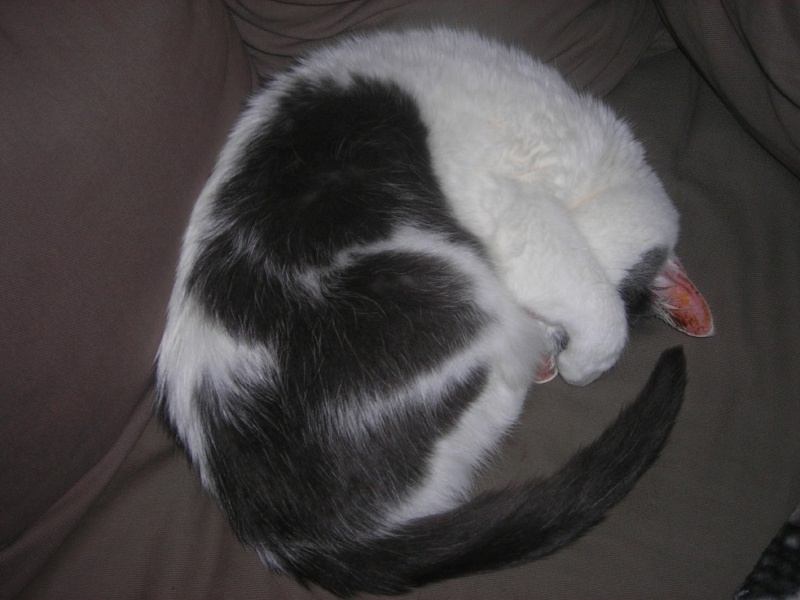 I took this photo of "Mouse" on 13-December-2010. Great eyes. 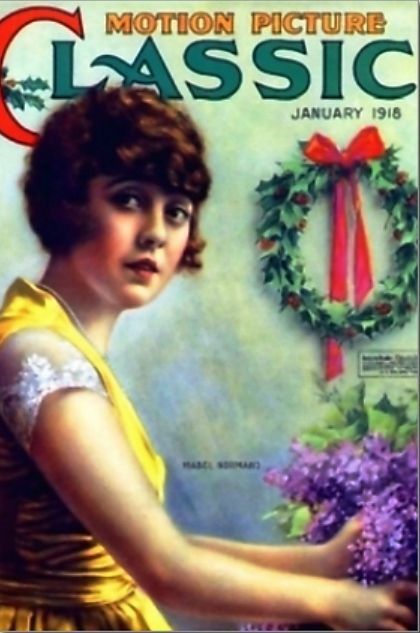 Just in time for Christmas, a pretty picture of Mabel Normand. When she was in her teens, Mabel Normand starting posing as a model for artists such as Charles Dana Gibson. She started acting in movies for several studios including Biograph, where she met Mack Sennett. When Sennett left Biograph to start Keystone in 1912, Mabel went along. She was engaged to Sennett for while, but they never married. People still debate the reasons. She became one of Sennett's most important comedians, but, like his other comedians, left Sennett for other studios and more money. Mabel starred in a series of popular features for Goldwyn, went back to Sennett, but then became tangled up in scandals, for things with which she was not involved. She died of tuberculosis at 37. 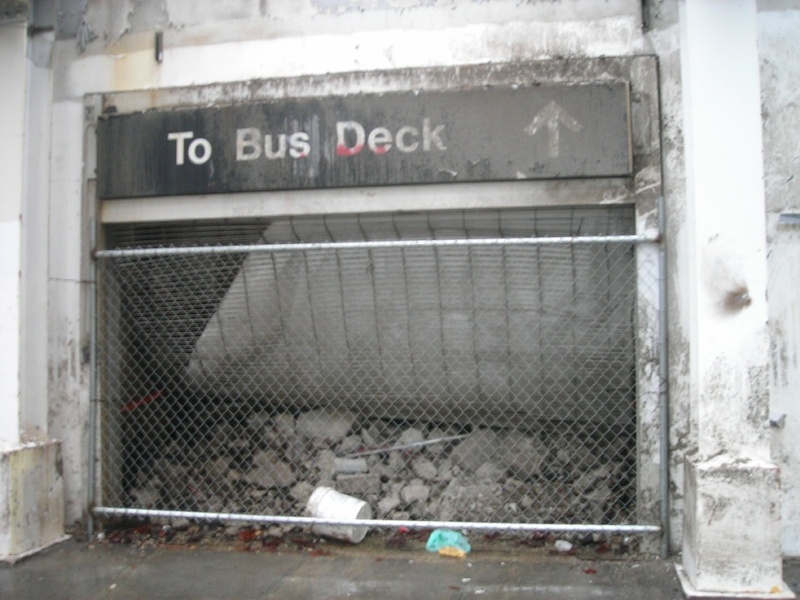 Here is an entrance to the East Bay Terminal on 10-December-2010. 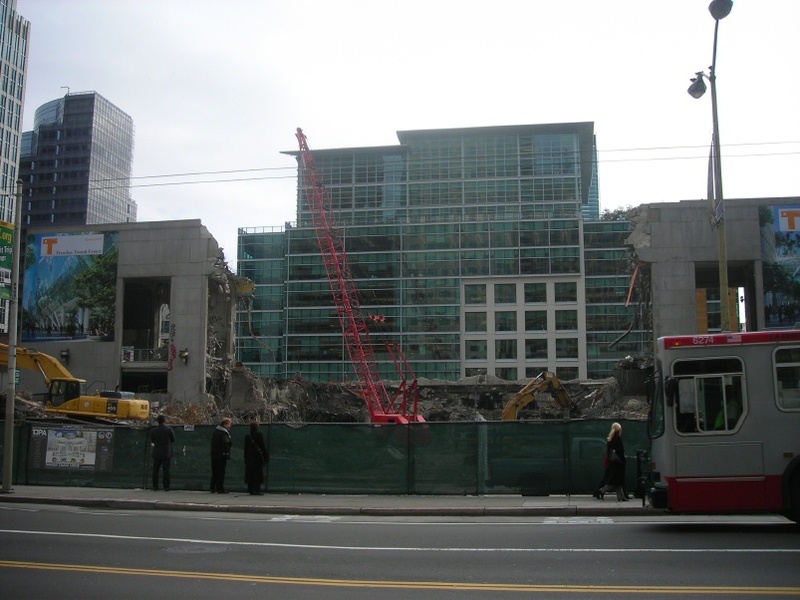 The ramp over First Street had just been demolished. Today we played tourist. Yesterday I bought three one-day Muni passports. 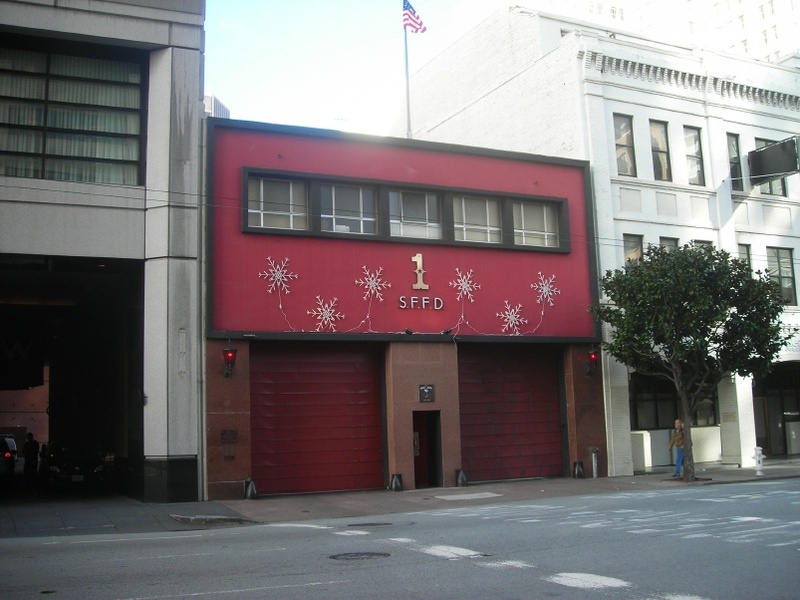 We parked at Fifth and Mission and caught Milano car 1818 decorated for Christmas. We got off at Drumm and caught California Street cable car 60, decorated for Christmas by my friend Val Lupiz. We got off at Taylor, intending to look around Grace Cathedral, but there was some kind of event going on. We walked over to the Fairmont to see the giant gingerbread house. We went down the hill to the cable car barn. I had heard they were remodeling the recreation center, but actually it had been torn down. I got some photos of a different angle of the barn. We found that the Powell Street cable was stopped. We walked down to Powell and Jackson to catch a car. 21 was stopped inbound just patch Washington. We later learned that there had been a hairball, an unstranded cable. We caught an almost empty blue and gold car 16 on the Powell-Mason. I pointed out John Street, where my family had once lived, and looked for apartments where other relatives had lived while I was alive. We got off at Bay and Taylor and walked over to the IHOP for lunch. Since we flew to Southern California, we had not made our traditional stop in the summer at the IHOP in San Luis Obispo. We walked out to Hyde and Beach and found a short line, so we joined it. We watched Escape Man do his act. He had an assistant chain him to a lamppost, then struggled free of the chains and a strait jacket. Not bad. We saw car 11 which had been decorated and we got on 13, which had been decorated by the Buena Vista Cafe. We had a nice ride back to Powell and Washington. The substitution bus was jammed. We also saw 6, which had just gotten out of the paint shop. It had no dings except in the bell. The Union Square area was jammed, but we stopped to see the sugar castle at the Saint Francis and the animals at Macys. 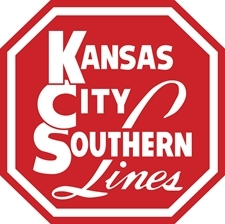 The Kansas City Southern Railway recently announced that it is going back to an old corporate logo. I like it. We had a lot of drizzle and some rain today. Doctor Peter Henri Van Der Weyde wrote the series of articles which gave this blog its name. His son, Henry Vander Weyde (this is how he spelled it) served as an officer in the Union Army. After service in the American Civil War, Henry emigrated to England, where he became a pioneer in taking photographs using artificial light. He made the drawing during his time as a prisoner of war in Virginia's Danville Prison. Click on the image to see a larger version. George Haven Putnam delivered this memoir of his imprisonment during the war 100 years ago, on 10-December-1910 to the Military Order of the Loyal Legion of the United States, a veteran's organization. After the war, he carried on the family publishing business. AN EXPERIENCE IN VIRGINIA PRISONS DURING THE LAST WINTER OF THE WAR. Read Before The New York Commandery, December 7, 1910, By Companion George Haven Putnam, Adjutant And Brevet-major, 176th Regiment, N. Y. Vols. Putnam was taken prisoner during the Battle of Cedar Creek, part of the Shenandoah Valley Campaign in 1864. The prisoners were marched south towards Richmond. In the course of the evening, our guards remembered to scatter among us a little hardtack taken from one of our own commissary wagons, but the ration was very small for the amount of marching that had to be done with it. Sometime before midnight, in company with Vander Weyde with whom I had fallen into "chumming" relations, I made a break for liberty. We remembered the region through which we had marched not long before as "ruthless invaders," and it was our idea to strike for a ditch which was on the farther side of a field adjoining the road. We bolted just behind the nearest guard and took him so far by surprise that his shot and that of the guard next in line did not come near enough to be dangerous, and we succeeded in tumbling into the ditch which we found unfortunately to be no longer dry. There was, in fact, an inch or two of water in the bottom. There was nothing to do but to he quiet and wait until the column of prisoners and guards had passed. We were disappointed, however, to find that the sound of the marching continued for an indefinite period; and in fact pretty soon there were added to the tramp of feet sounds from a long series of wheels. It was evident that the trains, or such of the wagons as remained of the trains, were being moved southward. Then there came a rumble which seemed like that of field-guns. While we were puzzling in our minds as to whether the whole army could really be on the retreat, the question was answered in a most unsatisfactory fashion. Not only were Early's troops marching southward but they were going with such urgency that the road was not sufficient for their purpose. They were straggling into the fields on both sides, and a group of two or three, too tired and too sleepy to watch their steps, tumbled into our ditch on top of us. They said things and so did we. Our state of mind was in fact like that of South Carolina three years earlier; we only wanted to be let alone. But that privilege was not granted to us. We were hustled out of the ditch, chilled and out of temper at our failure and at what seemed to us the unnecessarily rough treatment of our new captors. We were, so to speak, butted back into the road and hustled along from group to group until in the early hours of the morning we found ourselves again in the column of prisoners. I understood later that our cavalry had pursued that column through a large part of the night and we must have done pretty lively marching to keep ahead of them, but the horses doubtless were tired on their part. They arrived in Richmond's Libby Prison. Floor space was made for us under the supervision of one of our own officers who took upon himself the responsibilities of what might be called quartermaster's duties. At our request, Vander Weyde and myself were given floor space together, and we then took an account of our joint property. I had picked up en route (I do not recall where) a small piece of blanket and I had also succeeded in retaining a broken pocket knife. My chum had a tin cup and a pocket comb. These things were held in common. As personal appurtenances we had been fortunate enough to save our tooth-brushes which the examining sergeant had not considered worth appropriating, and my chum, who was a clever artist, had also been able to retain possession of a pocket sketch-book and a pencil. These tooth-brushes later became noteworthy. It is my memory that there were not more than a dozen or so among about 350 officers. The possessors placed their tooth-brushes through the buttonholes of their blouses; partly because there was no other safe or convenient storage place, and partly perhaps to emphasize a sense of aristocratic opulence. We became known as the "tooth-brush brigade." My chum, with some protest from me against the using up of my knife, did some artistic carving on the handle of his brush, producing with no little skill a death's-head and a skeleton. Late in the winter, when we had been moved to Danville, one of the officers of the guard offered me for my brush $300, of course in Confederate currency. I expressed a little surprise that the article, no longer new, should have such selling value, and he began to reply, "Well, but you see now we cannot get any more," and then checked himself. The word "now" emphasized itself on my ear, and connecting this with certain rumors that had already leaked into the prison, I realized that Wilmington must have fallen and that no more tooth-brushes or other supplies from England could be secured. But this is, of course, advancing in my narrative. In Libby, as later in Danville, the prisoners comprising as said, only commissioned officers, maintained an organization and ordinary discipline. We accepted as authoritative the orders of the senior officer in the prison, and this officer associated with him two or three men who divided up between them responsibilities for keeping order, for assigning quarters, for adjusting difficulties, etc. Our general went through the form, and it was not much more than a form, of appointing on his staff a commissary. It was the duty of this officer to receive from the prison sergeant the daily ration and to arrange for an equitable distribution of such ration among the prison messes. We had, for the convenience of such distribution, been divided into groups of six or eight. The so-called commissary had, of course, nothing to issue but the ration that was brought in. His office reminded me of the description given by the young showman in the menagerie, "this is the jackal what perwides for the lion always perwiding that there is anything to perwide." The Libby ration in these last months of 1864 comprised soup made out of inconspicuous little beans, and a chunk of corn bread. During the close of our sojourn in Libby, the soup part was cut off and the ration reduced itself to the corn bread. The corn bread as baked was marked out into squares, but for some reason which I never had explained to me, each square of corn bread was a ration not for one but for two. The messes, therefore, were subdivided into pairs and the chums had to arrange between themselves each morning for the division of the flat chunk into two portions. My chum and myself took turns in cutting that chunk into two pieces. On one piece was laid the broken knife and the man who had done the cutting then called to the other fellow, who stood with his back to the cake, to say whether he would have it "with" or "without" (the knife). Whichever piece one got, the other always looked a little bigger. We regretted to part with the black bean soup, although we had not been fond of it. It contained about as many bugs as there were beans, the taste was abominable, and the nourishment probably slight. I understood later, when I was on parole in Richmond, that the beans and cornmeal issued to the prisoners had been rejected by the commissaries as unfit for their own troops. I should not venture to estimate with any precision the size or the weight of the chunk of corn bread which came to us once a day. My memory is, however, quite clear on the point that it was absurdly small. Some of us went through the form of cutting our chunk into three pieces with the idea that we would make three meals out of it; but it was very difficult to avoid eating up the three meals within the first hour even though we knew that we should have to wait until eleven o'clock the next morning for another chunk. Large or small, the chunk was not even nourishing throughout. The cake as baked contained other things besides corn-meal. Pieces of the corn-cob were ground up indiscriminately and we also found in the cake cockroaches and other insects and occasionally pieces of mice who had lost their way in the meal-bins. In reply to complaints that were from time to time submitted, the prison officers had nothing to say but that it was the best they had and that the Yankees had better be thankful that they got anything. I judge that by December, 1864, it must have been a very difficult task indeed for the rebel commissary general to secure by his two lines of single track roads, one of which was from time to time being cut by our raiders, sufficient food to supply the army and the townspeople. It was not surprising that the fare remaining for the prisoners should have been inconsiderable in amount and abominable in quality. The stupid brutality of the whole business was in keeping prisoners at all in Richmond during the last winter of the war; for that stupidity which, as it meant the loss of many lives, may fairly be described by the simpler word of murder, the responsibility must rest with Jefferson Davis, Commissioner Ould, and General Winder. 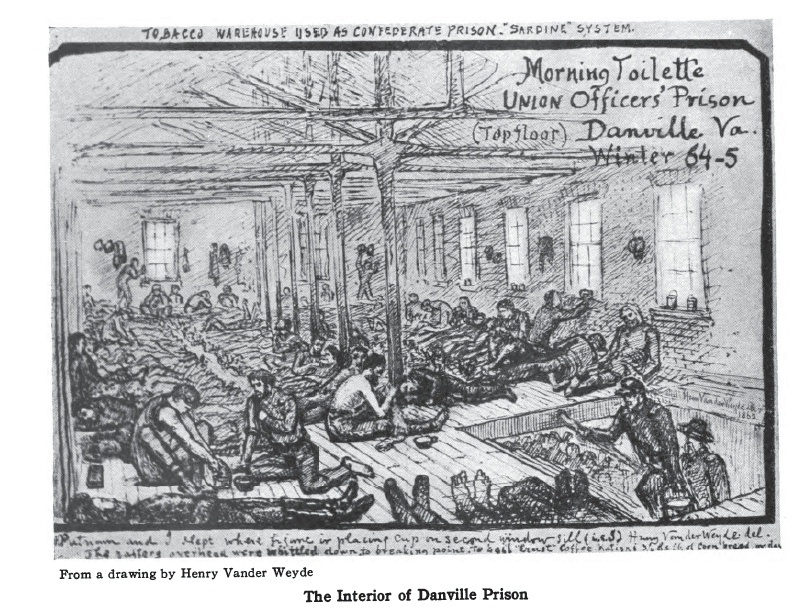 They were moved to Danville Prison, in Danville, Virginia. My selection of a chum proved fortunate in one way that I could not have anticipated. Vander Weyde was clever with his pencil and some portraits that he had sketched of the guards attracted attention not only in the prison but with some of the officers outside. He was fortunate enough to be invited by one or two officers who had homes in town, to go to their houses and to sketch wife or daughter. He objected properly enough that his blouse was shabby and his trousers disreputable and also that in the absence of soap he was not fit for the presence of ladies. The officers wanted the portraits, and the result was that the fortunate Vander Weyde secured a bath with real soap, and a jacket and pair of trousers that held together and that gave hirn in the midst of the rags with which he was surrounded, the appearance of an aristocrat. The rags discarded by the swagger artist enabled me to do some very important patching on my own garments. Further, in going first to one house and then to the other, Vander Weyde had the opportunity of getting something to eat and finally, and that is where I came in, he was thoughtful enough to remember to stow away in a pocket a couple of hoe-cakes for his chum. It was Vander Weyde's good fortune a few months later, to serve on the staff of the officer who commanded the advance brigade of the troops taking possession of Danville. His commander, knowing of his prison experience, authorized him to receive from the mayor the formal surrender of the town. Vander Weyde had, during his experience as a working artist, been a guest at the mayor's house and had been there cared for by the mayor's wife. He had, therefore, an additional motive for desiring to make the function of surrender as gentle and as informal as possible. He found himself, however, received by the mayor with the utmost severity and with not the slightest sign of recognition. In April, 1865, the mayors of Virginia towns found it difficult, and it was quite natural that they should have found it difficult, to accept any social relations with the triumphant invaders. 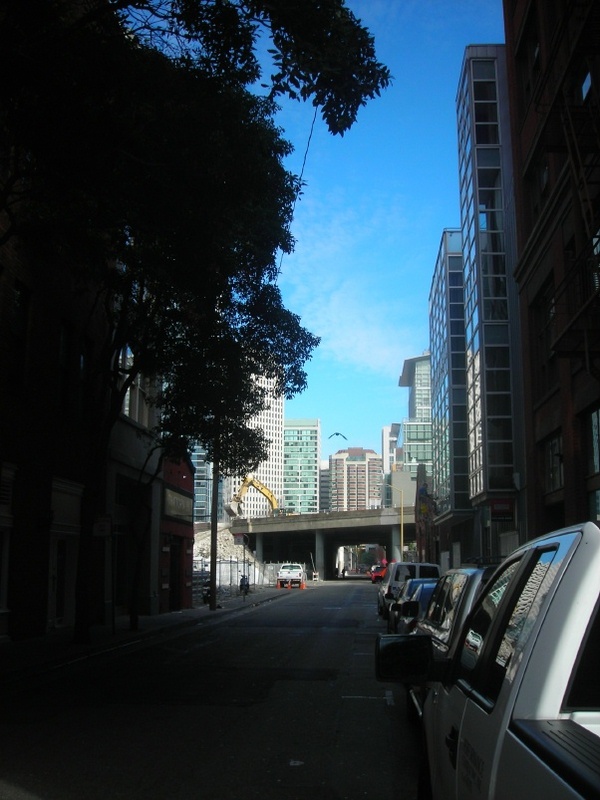 Looking down Natoma from Second Street at the exit ramp from the East Bay Terminal, which was being demolished on 01-December-2010. We had heavy rain today. 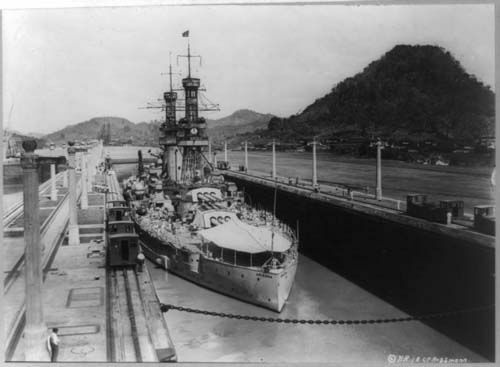 69 years ago a sneak attack by forces of the Japanese Empire sank much of the US Pacific Fleet, including the battleship Arizona, shown transiting the Panama Canal in 1921, at Pearl Harbor in the territory of Hawaii. The Japanese Empire came to regret doing this. Station One, on Howard near Third, decorated for Christmas. This station will get torn down soon for an extension of the Museum of Modern Art. I took the photo on 01-December-2010. It got dark early and started raining in the afternoon. I was debating with myself whether I should write about the Boeing X-37B space plane, which landed yesterday after seven months in space, or about Ron Santo, who died on Thursday. Then we got out of the car on our way to 5 o'clock mass and saw this. School kids helped us take up the second collection for support of the school. Today they started to demolish the main building of the East Bay Terminal, which opened in 1939 to serve the electric trains of the Key System, Southern Pacific's Interurban Electric Railway, and the interurban Sacramento Northern. 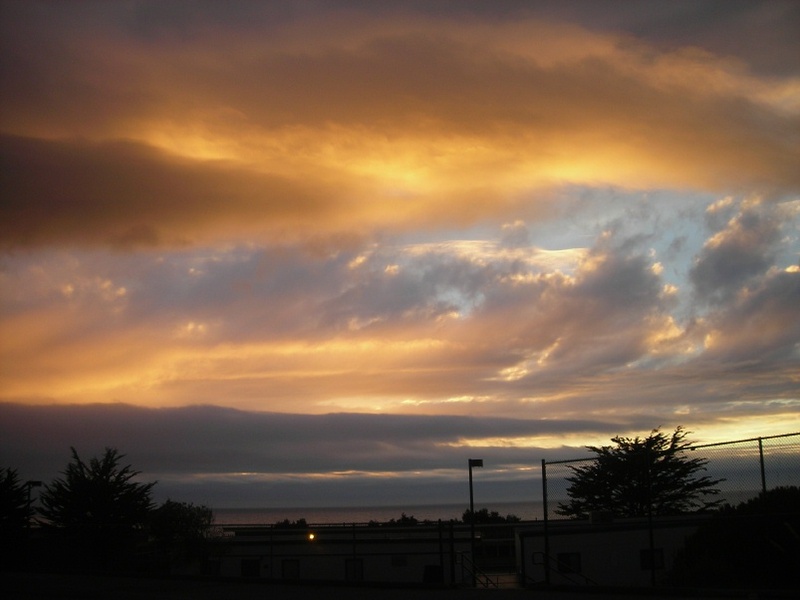 I took the photo on 10-August-2010. Special Dispatch to the Call. FRESNO, December 18.-- Dropping from a height of more than 4,000 feet after his engine had "gone dead" and his machine had been left to the mercy of the elements, J. C. Mars, a member of the Curtiss camp of aviators, today came safely to earth following one of the most sensational exhibitions of aerial navigation ever witnessed. The downward swoop of the plucky birdman took place before 10,000 persons at the fair grounds in this city. So skillfully did the aviator guide his frail craft, however, that a realization of the awful battle taking place did not reach the big crowd until Mars had returned to the earth. Mars had started out to break the Pacific coast record for altitude made by Louis Paulhan at Los Angeles. Gracefully he rose into the air and as he swept around the field he mounted higher and higher into the sky until no longer could the crowd below hear the whirr of his engine. Suddenly the other aviators were horrified to see Mars suddenly dart toward the earth. Involuntary cries broke from the lips of both Curtiss and Willard, and Mrs. Mars, who was seated in an automobile, shrieked with horror as she, too, realized, what was taking place thousands of feet above her. Once around the field Mars glided his machine swiftly losing its momentum. Unable to hold it in the air any longer he tilted the planes downward and swooped toward the earth. Mechanics made frantic efforts to remove Willard's machine, which seemed to be directly in the path of the oncoming aeroplane, but Mars passed 300 feet over them heading directly for a row of automobiles which lined one edge of the field. His cool nerve saved the daring young birdman at the last moment. Had his machine gone straight ahead it would have crashed into the automobiles, but Mars almost stood it on end as he turned it right about and glided down in perfect safety. Glenn Curtiss described the drop as one of the most thrilling bits of aerial navigation he had ever seen. He was the first to grasp the hand of Mars when he left his machine, and congratulated him on his success. While climbing upward Mars struck a cold strata of air which froze his engine and put his biplane out of commission for the remainder of the afternoon. Earlier in the day, however, he made a thrilling glide to earth from a height of about 1,200 feet. Glenn Curtiss added to the features of the meet today by making the fastest time for five miles ever made by an aeroplane on a circular track. The time was 5:05. Curtiss used his new biplane, and in circling the track never rose to a height of more than 20 feet at any time. Three of the miles were made in three minutes. The crowd was also entertained, and frightened. as well, when the aviators, all made individual flights, dipping and plunging, sometimes skimming close to the ground, and other times shooting up to a height of 50 feet. On one occasion Mars almost struck a dog that had wandered into the field, diving down from a height of about 20 feet to reach the animal.